Debut recording released - "If this world could stop"
Hailed by Fanfare Magazine as "simply gorgeous...with a fully loaded palette of tone color" Lindsay Kesselman is a soprano quickly becoming known for her soulful singing and her exemplary musicianship. 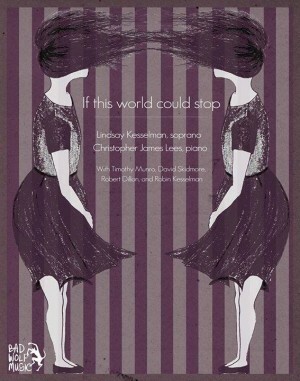 "If this world could stop" is her debut solo album, recorded in collaboration with pianist Christopher James Lees, and features a wide array of captivating and deeply intimate music by contemporary American composers, both established and emerging. Featured composers include David Lang, Amy Beth Kirsten, Lee Kesselman, Abbie Betinis & Sarah Gibson. Guest collaborators include Timothy Munro (eighth blackbird), Rob Dillon & David Skidmore (Third Coast Percussion) and Robin Kesselman.